Accessed from South Road, this prestigious building fronts onto and overlooks Marine Parade, a prime beachfront location on the unspoilt seafront of this ancient Cinque Ports Town, with its long stretches of shingle beaches and on a level approach to the Royal Military Canal and busy High Street, which enjoys a variety of independent shops, boutiques, cafes, bars and restaurants. In addition there are 4 supermarkets (including Waitrose, Sainsbury and Aldi). There is also a selection of sports and leisure facilities in the vicinity including tennis, bowls, cricket, squash and sailing clubs as well as water sports facilities. The larger town of Folkestone is around 5 miles and the Cathedral City of Canterbury is approximately 17 miles distant. 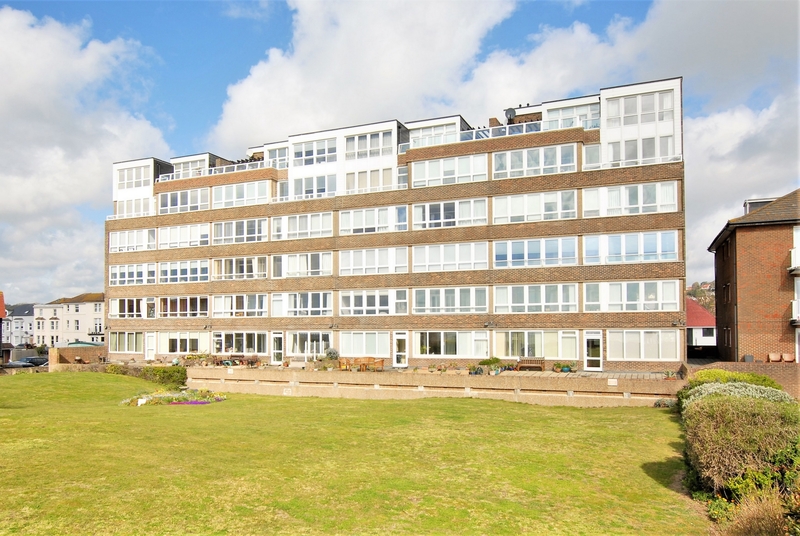 Built in the 1970's by Charliers, a local developer held in particularly high regard, Admirals Walk is widely considered to be one of Hythe's most desirable developments of purpose built apartments. It occupies a prime beachfront position and commands stunning views of the English Channel, around the bay to Dungeness and of the coast of France on a clear day. In addition, to the side and rear, views can be enjoyed over Hythe's pretty hillside, of St Leonards and to The Roughs to the west. This second floor apartment, which is served by a lift, offers generously proportioned accommodation approaching 1300 square feet in total and designed to maximise the stunning sea views which can be enjoyed from each of the principal rooms. The accommodation includes an entrance hall leading to the 37ft dual aspect living space, a well appointed kitchen, three double bedrooms, a bathroom room and a separate cloakroom. Accessed from the sitting room and two of the bedrooms is the sun room, the perfect vantage point from where to relax and soak up the beautiful sea views. The apartment also benefits from a secure store, an allocated parking space within the secure car park and the use of the pretty communal gardens. Services: We are advised that the service charge was is £2354.25 for the last six months. This covers heating, water supply, buildings insurance, lift maintenance, maintenance of the communal areas and gardens and an onsite caretaker. Lease: 999 years from 2005 - Share of Freehold included.